Metal Hydride is a metal powder that can be used to store hydrogen for use in hydrogen fuel cells. In practice the Metal Hydride fuel stores take the form of a series of metal cylinders, kept at less than 10 bar pressure. 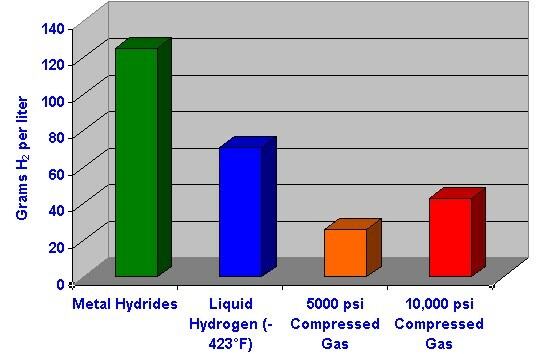 Reducing the pressure slightly frees the hydrogen from the powder and allows the gas to be channelled to the fuel cell. When all the hydrogen is exhausted, the powder store is recharged with the gas. The big advantage of metal hydride is that there is no high-pressure gas or liquid - a safety concern over most existing hydrogen vehicles. Its downside is its extra weight, making it unsuitable for use in cars. However metal hydrides could be ideal for ships, with the extra weight providing or replacing ballast to keep the ship stable.